We headed up to Kentucky Friday night, and while we didn't do much to celebrate Cinco de Mayo, I wore my official shirt that I don most every year, and had a few celebratory drinks among friends. Thats not saying that I won't be recreating one of these (here & here) yummy looking 'ritas after work this week... does the celebration ever really end? What did you do to ring in the cinco? Are you still celebrating the ocho like me?! LOVED your comment on my tips/tricks page! Thank you so much for taking time to comment! I really enjoy keeping up with your blog. Keep in touch! 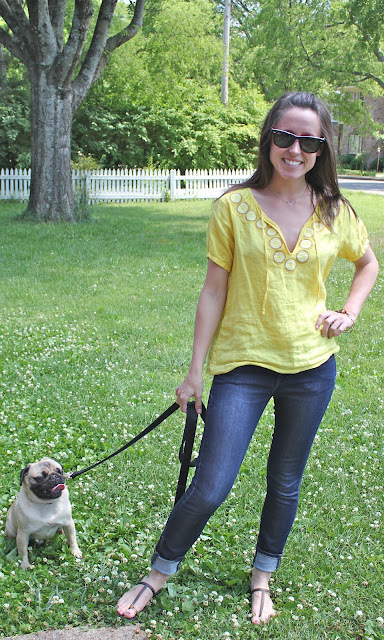 loving the yellow blouse and your fabulous sunnies - such a great statement! i love the embroidery on that shirt! and that color looks awesome on you! Love your shirt! It's a gorgeous color on you! I celebrated Cinco de Mayo studyin hahah. Love the shirt though. So cute how you keep a tradition!! I just want to reach in and give that pug a squeeze. Must admit I was all about the derby this year, and still have not had a margarita. (what is wrong with me?) Loving you in yellow, looks great! Yellow looks great on you. Didn't do much to celebrate Cinco either. Love the Ray Bans on you. We definitely should be blogging friends! If I am ever in SLC... I know who to call! Thank you for your sweet compliments! Darn those ex-girlfriends... 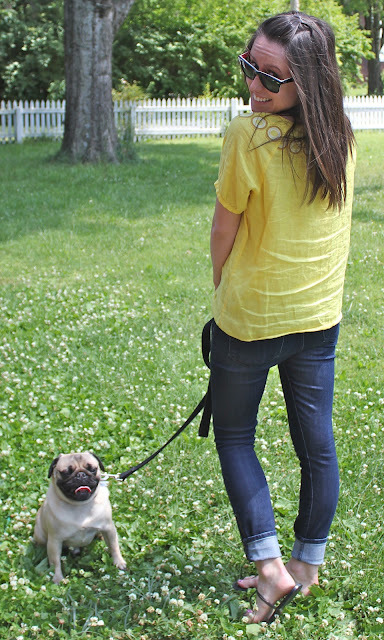 I have some tales too :) But denying you a pug... that is pretty bad! Ohh I am such a crawfish fan... that sounds yummy! I love yellow on you! You look super cute in those sunnies and just so happy! Love it. Super cute as always! I think yellow is your color! We actually ate crawfish on Cinco de Mayo...go figure, right? !